The Pythagorean theorem can be used to solve for any unknown side of a right triangle if the lengths of the other two sides are known. The Pythagorean theorem can be used to solve for any side of an isosceles triangle as well, even though it is not a right triangle. Isosceles triangles have two sides of equal length and two equivalent angles. By drawing a straight line down the center of an isosceles triangle, it can be divided into two congruent right triangles, and the Pythagorean theorem can easily be used to solve for the length of an unknown side. Draw your triangle upright on a piece of paper so the odd side (the one that is not equal in length to the other two) is at the base of the triangle. For example, assume an isosceles triangle with two sides of equal but unknown length, one side measuring 8 inches and a height of 3 inches. In your drawing, the 8 inch side should be at the base of the triangle. Draw a straight line down the middle of the triangle from the vertex to the base. This line must be perpendicular to the base and divide the triangle into two congruent right triangles -- for this example, each with a height of 3 inches and a base of 4 inches. Write the values of the lengths of the known sides of the triangle next to the sides they match. These values may come from a specific math problem or from measurements for a certain project. Write "3 in." next to the line drawn in Step 2 and "4 in." on either side of this line at the base of the triangle. Determine which side is of unknown length and use the Pythagorean theorem to solve for it using a calculator. The unknown side is the hypotenuse of each of the two triangles. Label the hypotenuse "C" and either of the legs of the triangle "A" and the other one "B." 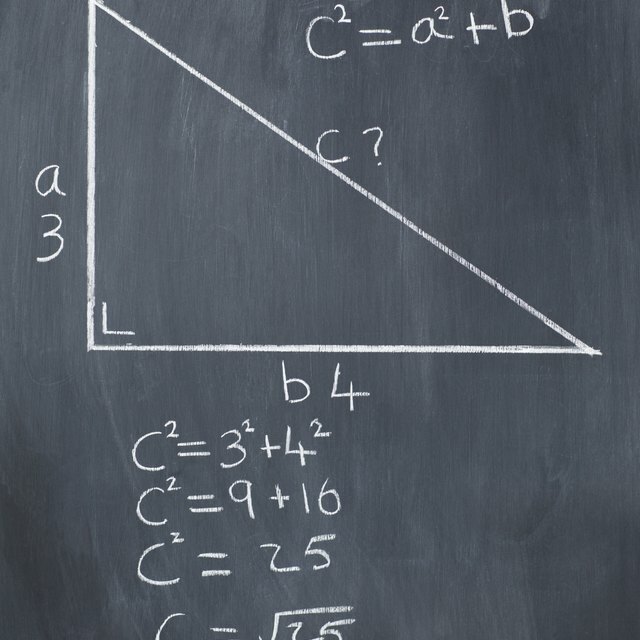 Substitute the values for A, B and C into the Pythagorean theorem, (A)^2 + (B)^2 = (C)^2. For one of the two triangles constructed in this example, A = 3, B = 4 and C is what we are solving. Therefore, (3)^2 + (4)^2 = (C)^2 = 9 + 16 = 25. The square root of 25 is 5, so C = 5. The isosceles triangle we started with has two sides measuring 5 inches each and one side measuring 8 inches. The equation for the Pythagorean theorem is the square of the triangle's base added to the square of the triangle's height is equal to the square of the triangle's hypotenuse -- [(A)^2 + (B)^2 = (C)^2]. The hypotenuse is the line that connects the base and height of a right triangle. The legs of a right triangle are the two sides that form the right angle. Use half of the original length of the base of the triangle as the base value for the right triangle, as you divided the triangle into two equal halves. Celebi, Sarah. "How to Use the Pythagorean Theorem for Isosceles Triangles." Sciencing, https://sciencing.com/use-pythagorean-theorem-isosceles-triangles-8414313.html. 24 April 2017.